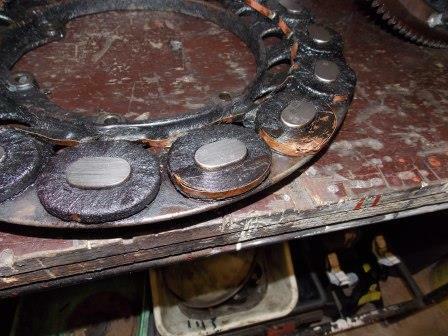 I am installing magnets on my flywheel, i have new screws and spools, the magnets have all be recharged and checked for cracks, my question which do i tighten first ,the screws or the bolts and how tight should they be?, it looks like it would be easy to twist off the screws, i have the gap gauge to be sure they are even. Suggest to keep bolts finger tight and the clamp screws just snug ...... you'll find that the aluminum spools may have to be removed to be dressed down to equal the magnet height determined by the gap guage. After all gaps are the same height, tighten down screws and bolts, recheck the gap, make adjustments then retighten, peen screw threads and safety wire the bolts. Leave anything out ??? Sure others will suggest. I would suggest shimming the spools rather than dressing them down. Using U-shaped shims saves having to remove the spools to insert the shim(s). I would suggest to anyone that is installing magnets that doesn't do it on a regular basis to do the following: Buy 1 or 2 more brass screws than you need, and tighten one down until it snaps. Usually one side of the head pops off and the split is at the bottom of the slot, sometimes the entire head pops off. The bottom of the slot and base of the head are generally the weak spots and this is generally where you will have a failure before the threads strip. 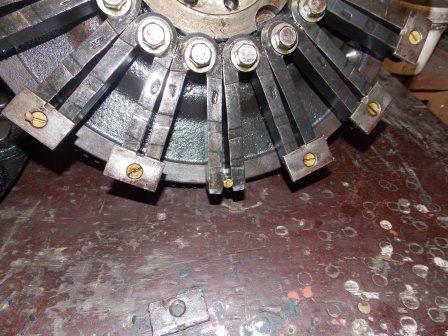 If the threads strip, then you should suspect that there is something wrong with the threads in your ring gear, or that maybe the thread of the brass screw is not correct. The reason I advocate this procedure, is because you just don't know what you are getting these days. For quite a while, only 1 vendor was making these, now 2 vendors make them. A couple decades ago, snapped off mag screw heads seemed to be a noticeable problem and I think there was issues with the way they were made. Although it is not a 100% sure thing that if one screw snaps at a certain torque, then all the rest of them are good at 2/3 to 3/4 of that torque, it is a relatively safe assumption that they probably all came from the same production run. I buy my mag screws 100 at a time and generally take 2 from each batch and see what torque they fail at to establish the torque I use for the batch. Over the last few years, I have found that the screws I use snap around 80 inch pounds. The torque I use in assembling them is 45 to 50 inch pounds, and then after all the heights have been set, then I do a final torque to 55 inch pounds before riveting over the ends. Also, the repro clamp plates seem to vary in thickness and the hole sometimes is not a good match to the taper or diameter of the screw heads. Not to mention that they seem to flex and bow more than the originals. I personally prefer to use good original used clamp plates over the reproductions because I think they end up being a little better quality. Bob is right by saying to dress the spools. U-shaped shim can get loose and will live there own live. A magneto rebuild is needed. I am confused, i looked in the service manual and it says to put like poles together, s to s, n to n, i thought it was supposed to be s to n ,n to s.? Like poles are mounted together in every case. The north poles of adjacent magnets are placed together,then the South poles of the two adjacent magnets are placed together and thus alternating in paired pairs around the flywheel. Page 227 Ford Owner. The MFTCA electrical manual has a clearer explanation of installation of the magnets. The Ford service manual is not real clear about this. I'm the type that has to see to understand and the MFTCA manual has a good "picture" of the magnet layout in it that shows the magnets with the poles marked to see them. I don't think the Ford service manual has a picture showing the poles marked. s to s and n to n. Any other way the magneto will not work! Rick, the last set I did was a shock to me to learn that the magnet heights were more than .020 difference between the thickest and thinnest magnets. When the magnet poles to coil pickup poles spacing is best at .030, you would have a very weak mag with some of those clearances measuring around .050. Those variations are way out of line for the tolerances of most Ford parts. Even though the spools appear to be all the exact same height, it is not an easy task to get the magnets all the same height without breaking the spools, unless you have a surface grinder to make the magnets all the same to start the job. James, if you have access to a surface grinder you are on the way to a great way to save a lot of time and effort. Just get the magnet heights to within say .010" height of each other, tighten up and pien the threads, and then surface grind the plates in situ on the re-built flywheel. Just go as far as needed to get things even. You don't even have to get down to the last clamp. One or two not ground will at least be within just a few thou " if you started with just .010" difference. I stake the brass screws instead of peaning. I found peaning can crush a spool and invariably loosens the contact. Just MHO. Thanks everyone, i have it all arranged correctly now and have all the magnets at the same height +- .002, i measured all the spools and they were all the same, i used a micrometer as a go no-go gauge i did have to rap a few with an aluminum hammer, but all is well now.